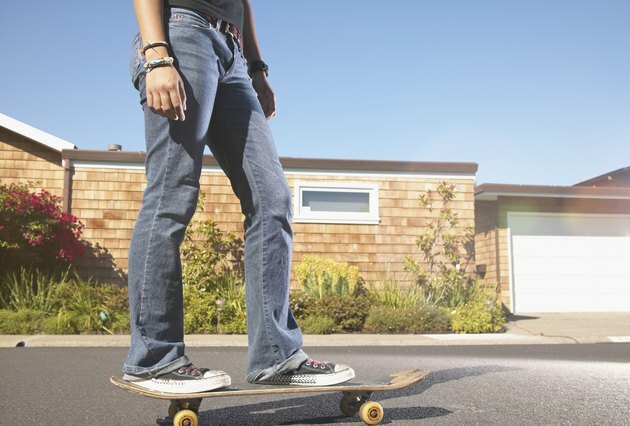 Your back is especially vulnerable to injury while skateboarding because it absorbs much of the impact during falls and landings, and it is also involved in maintaining balance and twisting motions. Lower back pain can stem from different types of injuries and can be prevented by strengthening exercises and stretching. One cause of lower back pain in skateboarders is muscle strains. Like all of the muscles in the body, sudden movements can injure back muscles. Your posture during the basic forward movement which involves bending your trunk and upper legs into a V shape may put strain on your lower back. Poor posture and overuse can also cause muscle injury, causing the muscles to spasm and be painful when used. Muscle sprains are classified as grade 1, 2 or 3, depending on the severity of the injury. Grade 1 tears cause mild discomfort, whereas grade 3 sprains can make walking difficult and can cause severe pain and swelling around the injured muscle, according to Sportsinjuryclinic.net. Lower back pain can also stem from problems affecting the spine itself. Skateboarders often land hard on their feet or buttocks and the impact is transmitted through the spine. Spondylolisthesis, also known as slipped vertebrae, can cause progressively worsening back pain. Impact injuries can also damage the vertebra and vertebral discs, which will also cause lower back pain in skateboarders. Lower back pain can be treated with rest, ice, compression and elevation, sometimes referred to as RICE. A back brace or crutches might help provide extra support for your back. If the pain is severe or gets worse over time, you might need to see a back specialist to ensure that your spinal cord is not injured. A licensed back specialist can also prescribe medications, specific exercises or massage to relieve your pain. Aside from avoiding hard landings and sudden movements, skateboarders can prevent back pain by keeping their backs strong. Back exercises will help provide extra support for the spine and reduce the risk of injury. A partial situp, in which you only lift your shoulders and head slightly off the floor, will improve your back's strength. Other recommended exercises include lying on your back and pulling your knees to your chest, and pelvic lifts.